The beachfront city of Torrevieja will be alive with the sounds of traditional folk music this week, as the south Costa Blanca locale hosts the annual spring Sevillanas fair, the Feria de Sevillanas. Torrevieja hosts the Sevillanas fair in the spring every year, and the Town Hall have spent nearly €100,000 to ensure that this years show is one to remember. Organised in association with local businesses and community organisations, the fiesta aims to showcase Valencian traditions, with live music and dance performances from some of the regions finest entertainment artists. 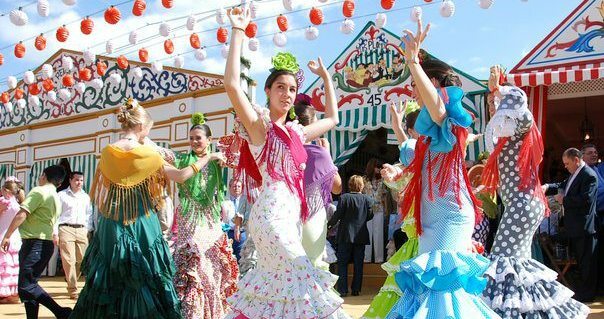 The Torrevieja Sevillanas fair is immensely popular with local residents and tourist visitors to the area in the springtime, and the five day celebrations are considered to be one of the most important cultural events in the local calendar. Locally known as the Feria de Sevillanas, the event celebrates the traditional dance and folk music of the Sevillanas, a type of muscial and dance style originating in Seville and its region. Derived from the Seguidilla, an old Castilian folk music and dance genre, the Sevillanas were influenced by Flamenco during the nineteenth century, and Sevillanas dancing and the music remains a popular tradition to this day. Local Valencian and Spanish cuisine forms a large part of each Sevillanas fair, and this year proves no exception, with 28 specialty food marquees filling the Torrevieja marina area, each serving freshly prepared local food. For more information about this local event visit the Torrevieja tourist office website, or see below for the exclusive full itinerary for the 2018 Torrevieja Sevillanas fair.